✎ Gary Vaynerchuk’s Top 10 Rules. Need motivation? Watch a Top 10 with Believe Nation! Grab a snack and chew on today’s lessons from a man who went from being born in the Soviet Union, hustling as a kid selling flowers and baseball cards, to growing his family wine business, founding VaynerMedia, and becoming one of the most sought after speakers alive! 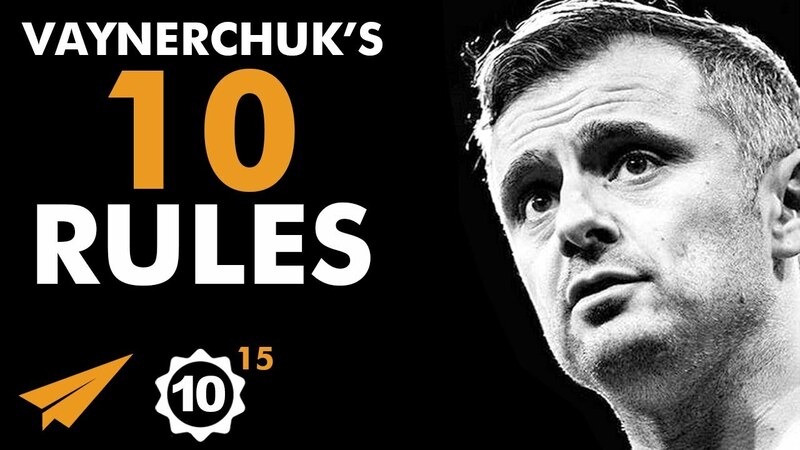 He’s Gary Vaynerchuk and here’s my take on his Top 10 Rules for Success Volume 15! 1. what box have people put you in that you need to escape from? 2. whose opinions do you need to stop listening to? 3. where do you most love the process in your business? ✎ More about Gary Vaynerchuk. As a kid, he operated a lemonade-stand franchise. He was born in the Soviet Union. At age 14, he joined his family’s retail-wine business. He grew the family’s retail-wine business from $3 million to $60 million a year by 2005. He’s best known as a digital marketing and social-media pioneer at the helm of VaynerMedia and VaynerX. He has been featured in “The New York Times”, The Wall Street Journal, GQ, and Time. He is a regular keynote speaker at global entrepreneurship and technology conferences. He has made a number of personal investments as an angel investor. In 2017 Entrepreneur magazine put Vaynerchuk’s net worth at $160 million. In 2017 VaynerSports signed NFL draft participants including Jalen Reeves Maybin and Jon Toth.